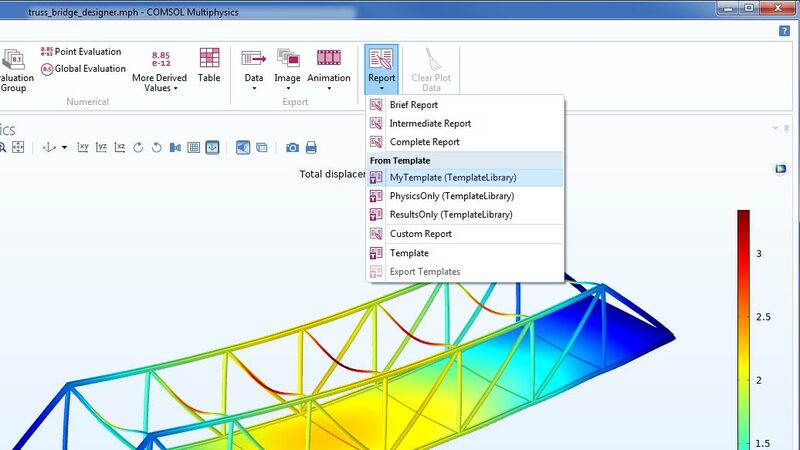 COMSOL Multiphysics® version 5.4 brings new postprocessing and visualization features and improvements, including arrows on streamlines, evaluation groups, and templates for creating reports. 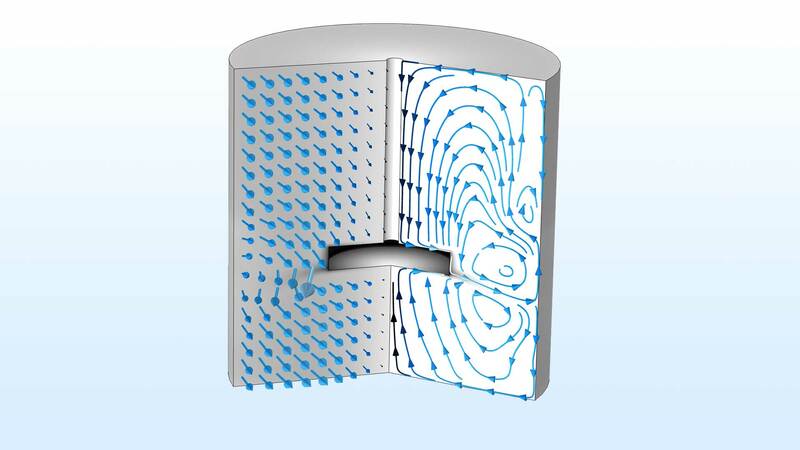 Browse all of the postprocessing and visualization updates included in COMSOL Multiphysics® version 5.4 below. Streamline plots have been improved with the addition of arrows on streamlines to highlight the direction of the velocity field. You can control the arrow distribution over the streamlines, helpful for visualizing the speed. A streamline plot with arrows in the Rotating Disk model from the Application Library. 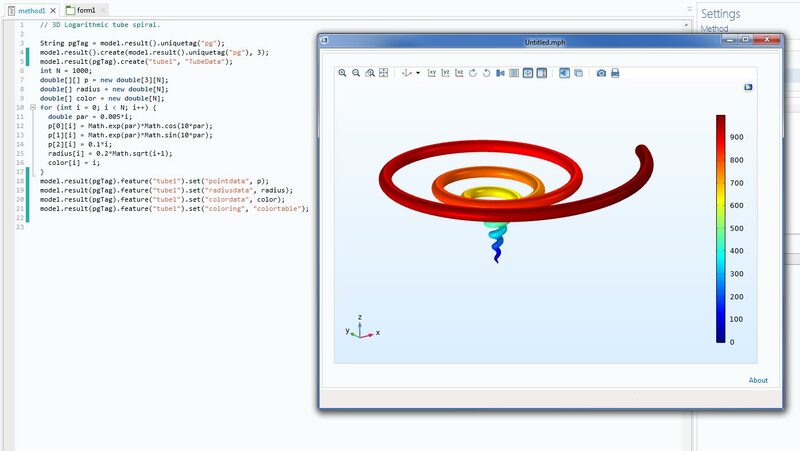 A streamline plot with arrows in the Rotating Disk model from the Application Library. 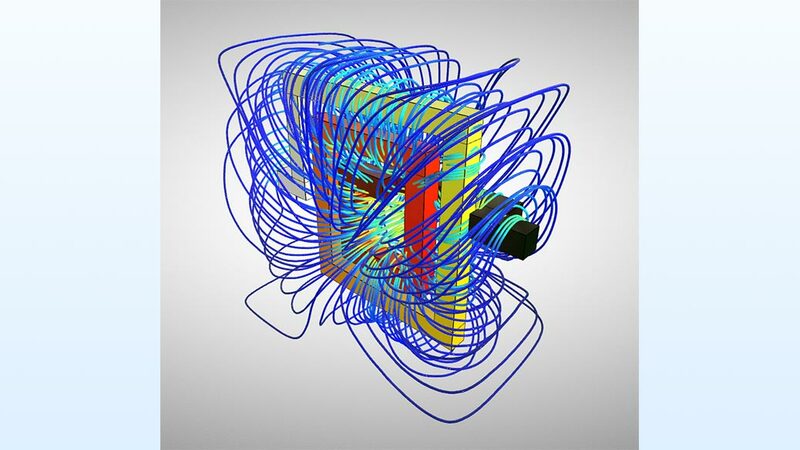 Evaluation groups offer a more structured workflow for performing numerical evaluations than what has been available in previous versions of the COMSOL Multiphysics® software. The relation between evaluation groups and evaluation features is similar to that between plot groups and plots. 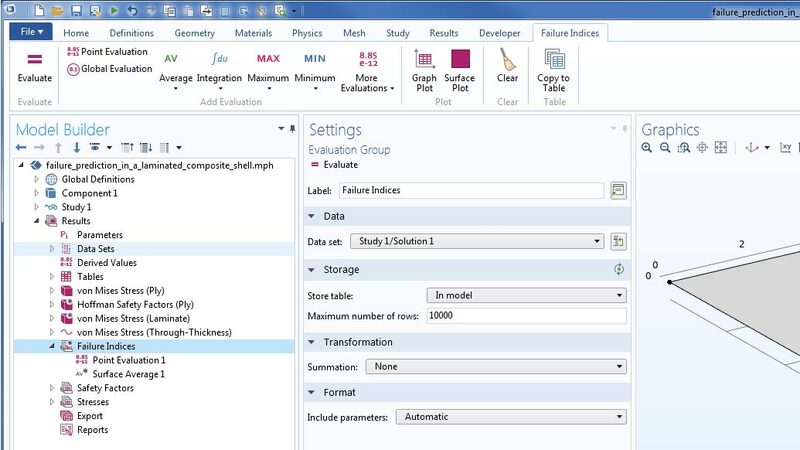 You can enable automatic update to Evaluate all of the evaluation features in the evaluation groups that refer to the computed solution. For anyone that creates reports often, report templates are useful for creating standardized, fine-tuned definitions of the contents of your reports. This can be used to streamline the workflow both on a user level and when standardizing report contents within a project or organization. The templates can also be saved to files that can then be distributed to other users. The extrusion data set extrudes a 2D geometry into a 3D geometry that can be used when postprocessing. This makes it easier to exploit situations where you know the solution's behavior in the z direction and only need to solve for the behavior in the plane. The data set can also be used in situations where a 3D plot would look better than the corresponding 2D plot even if the plotted expression does not depend on the z-coordinate. The 2D geometry and 3D surface plot of an extrusion data set in the Slope Stability Disk model from the Application Library. The 2D geometry and 3D surface plot of an extrusion data set in the Slope Stability Disk model from the Application Library. The surface slit plot is used for visualizing discontinuous fields; you specify one expression to be plotted on the upside and another to be plotted on the downside. Depending on what side you are looking from, you either see the value for the upside or the value for the downside. 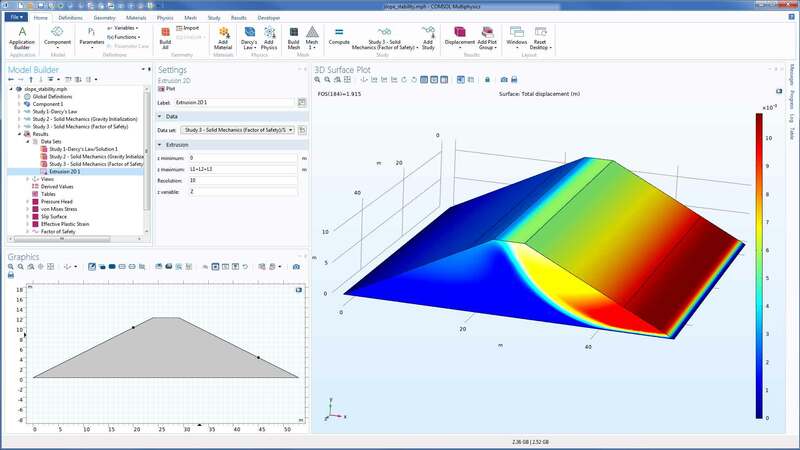 A surface slit plot is used in the ship hull model from the Application Library. 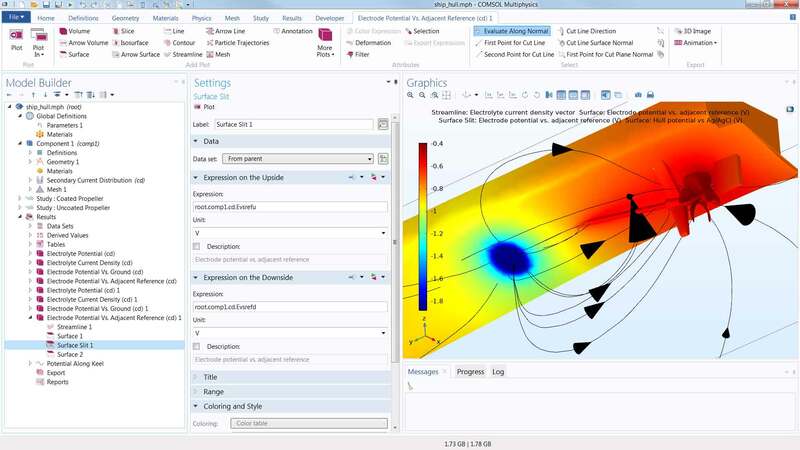 A surface slit plot is used in the ship hull model from the Application Library. The glTF™ file format is made for exchange of 3D scenes. By exporting a 3D plot group to the glTF™ format, you get a file containing a 3D representation of the contents of the plot group. These files can then be opened in the latest versions of Powerpoint, as well as in 3D visualization software such as, for example, Mixed Reality Viewer or Paint 3D from Microsoft®. You can also find glTF™ viewers online that run in web browsers. The method written here creates a Tube plot in the form of a spiral. The method written here creates a Tube plot in the form of a spiral. The time spent in generating visualizations consists of first evaluating the data and then rendering the graphics data using hardware acceleration (if available). The time it takes to generate visualizations is typically dominated by the first step, evaluating the data, but for large plots, the second rendering step can take noticeable time as well. For this second step, a new rendering algorithm renders large plots up to 3 times faster than previous versions. glTF and the glTF logo are trademarks of the Khronos Group Inc. Microsoft and PowerPoint are either registered trademarks or trademarks of Microsoft Corporation in the United States and/or other countries.